A Thanksgiving Moment to Last a Lifetime | Millennial-Led Public Relations & Marketing Consulting Firm in Dallas | EJP Marketing Co. Yesterday, my son and I walked around Downtown Dallas enjoying the cloudy, yet pleasant, weather. We (or rather, I) decided to visit Dealey Plaza and the site of the John F. Kennedy assassination. As we joined the crowds and dozens of people focused on the podium and speakers, we were all asked to take part in a moment of silence to mark the exact day and time that Kennedy was assassinated. It was a powerful moment to stand there alongside my son to mark such a turning point in our nation’s history. Our visit to Dealey Plaza may have been a coincidence, but it was a moment that offered the gift of a thousand reflections. Thanksgiving is about showing gratitude. But as the quote says, we should also look to show gratitude throughout our entire lives. 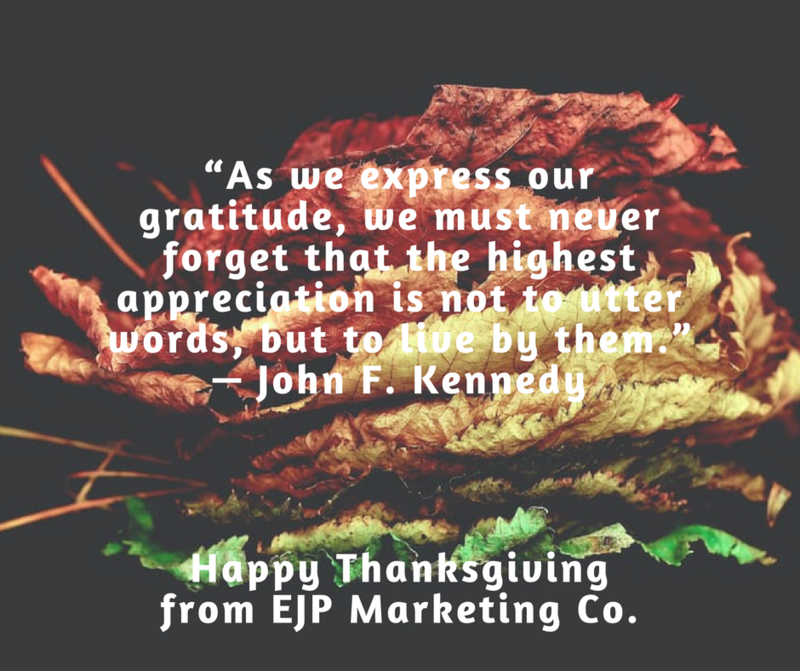 Our EJP Marketing Co. family is thankful for you! And today and everyday, we hope our actions continue to show this to all that encounter us. Founder & Principal at EJP Marketing Co.